First, the background story. Back in 2011, I wrote about making an offering to Tlaloc, Southwestern god of the hydrological cycle (among other things), at a tiny mountain spring near my home. The spring is high on the side of a ridge, fed by that year’s snow and rain, which meant it often dries up in late summer. It had its guardian, a three-foot-long (92 cm) rattlesnake, whom I encountered several times. The area was thickly forested in ponderosa pine, Douglas fir, and Gambel oak — too thickly, to my eye. (This is what comes of being a forester’s son.) The pines were thick — in some places they lay like jackstraws, toppled by the chinook winds of winter. When this slope burns, I thought, it will burn like a volcano. And it did, on October 23, 2012, a date seared into my memory. October 23, 2012: The spring would be just left of the brightest area. My home is on the other side of the ridge. I took this photo at dusk, bracing my pocket camera against a corral post (one of the ones that was not burning like a candle) while waiting for the the fire engine I was working on to be re-filled with water at the landowner’s well. It was too windy for air tankers, too close to darkness for hand crews to hike up there, so it just burned, while I implored the west wind to keep pushing the fire away from my home. M. and I returned in November 2012 to see if we could find the little spring again with all the landmarks gone. For instance, there was a boulder that I called Bonsai Rock because of the tenacious little evergreens growing out of cracks in the stone. Not anymore. Fisher the dog did what he does best, finding animal parts in the woods (including a bear cub’s paw) but even that activity seemed sadder. We returned again in May 2013 to make an offering at the spring. During the previous month, the Bureau of Land Management had hired a contractor to re-seed the area with a grass mix by helicopter. The purpose was to get something growing and stabilize the slopes against the summer thunderstorms. It worked. We had adequate summer rains (not like the storms and flooding in northern Colorado), and by late summer the slopes were almost lush, as the photo below will show. 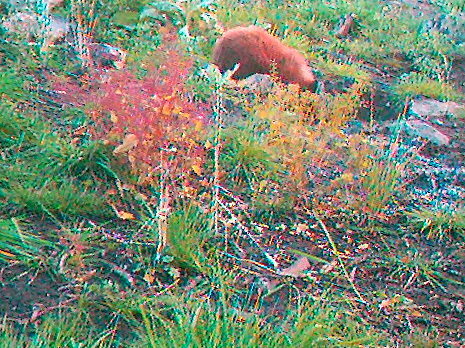 October 2013: A bear cub drinks at the spring. I put my most expendable scout camera up there from late September until a couple of days ago — although the batteries died some time in November — which is how I got the photo. The best part is to see the spring running—you can see water flowing down the right-hand edge of the photo. December 2013: Winter scene, with the spring off in the middle distance. All this is prelude to thinking about how an animistic/polytheistic outlook copes with such changes to the land. No, it is not like someone paved it over and put up a Family Dollar store. Something will come back—the scrubby Gambel oak has re-sprouted, and there were wildflowers last summer, but the ponderosa pine and Douglas fir will be much slower to return. I probably won’t see this valley forested again. 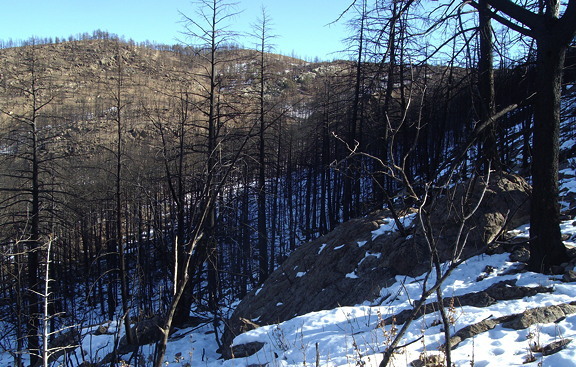 I will never forget walking around a week or two after the fire, when the slopes just felt nuked. Crows overhead were the only life—the rattlesnake guardian almost certainly died, if tree roots were being burned underground. The little seasonal spring, however, remains as sort of natural shrine, a focus for hope and continuity, bear cubs and wild turkeys. This entry was posted in Uncategorized and tagged animism, Colorado, fire, wildlife by Chas S. Clifton. Bookmark the permalink. Its amazing to see how nature recovers. Thank you for the pictures of the fire destruction in contrast to the return of the spring, plants and wildlife, especially the bear drinking at it. Blessings. What an incredibly moving story. It just goes to show the fragility and vulnerability of individual life – but the incredible strength and resilience of nature herself.